Mens Natural and Green Fairisle Crew Neck Sweater in Shetland Wool. Have had one of these sweaters, different pattern, for a number of years and they are smart and very warm. A first try of this indicates I will find it just as good. 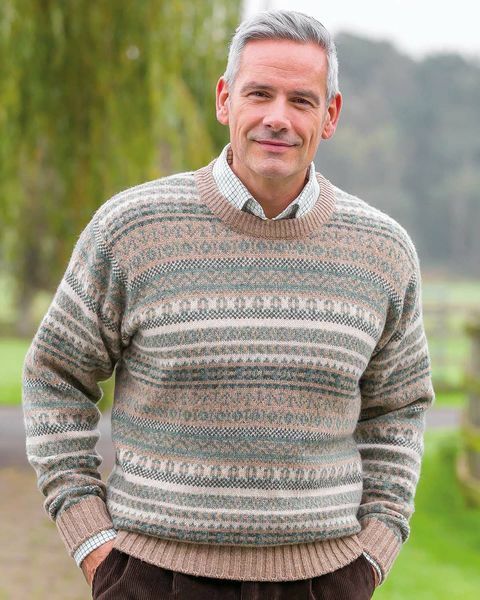 "Have had one of these sweaters, different pattern, for a number of yea ..."
Mens Frilled Shetland Wool crew neck jumper Knitted in the UK. Crew neck, drop shoulder style classic pure wool knitwear. The perfect choice for long autumnal evenings and cold winter days. A great way to keep warm and cosy in an array of co-ordinating colours.